You are buying VetriScience Canine Glyco Flex Stage 3 Mini Bite Sized Chews 60ct for small dogs, model #0900669060 at ADW Diabetes, we offer a wide range of pet dietary supplements geared towards helping your pet achieve optimum health. We offer these supplements in both single and discounted bulk packs with the goal of helping you save even more. Shop with ADW Diabetes for all of your pet health supplement needs. 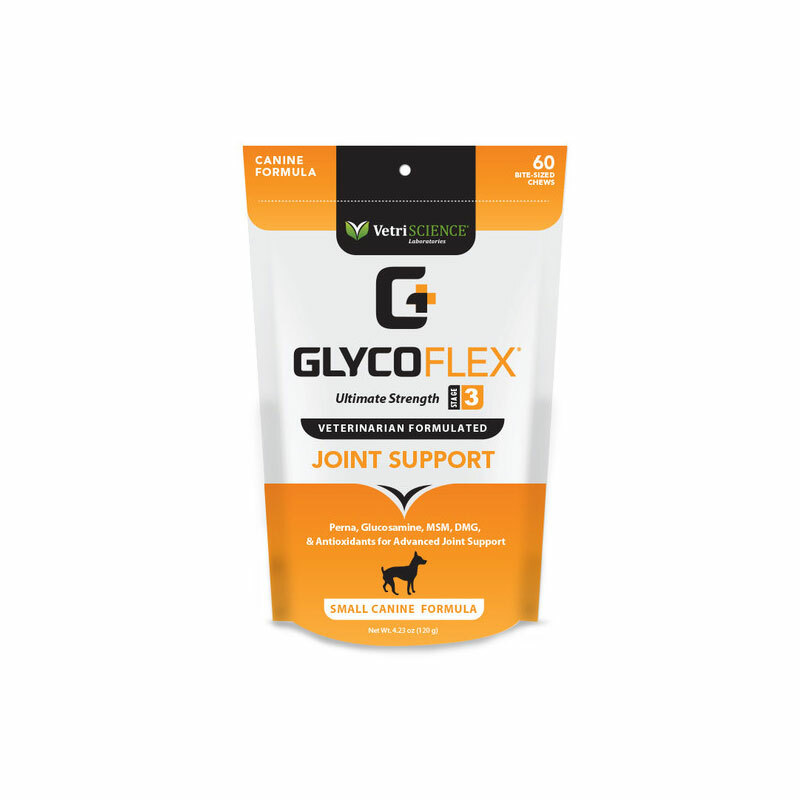 The VetriScience Canine Glyco Flex Stage 3 Mini Bite Sized Chews 60ct for Small Dogs is an advanced formula to support skin health and post surgical recovery. It includes important ingredients that support the immune system response and circulation, tissue recovery, histamine level maintenance, and protection against free radical damage. Essential fatty acids DHA and EPA support circulation and cellular integrity and health. DMG provides immune system support, while hyaluronic acid supports tissue hydration. The inclusion of MSM supports collagen production and contributes to skin texture and elasticity. Derma Strength™ also contains grape seed extract and perilla seed to support a healthy histamine response and manage histamine levels within normal ranges. Give 2 chews per 10lbs of body weight, daily. Give 1 chew per 10lbs of body weight, daily. Ingredients: barley flour, black currant oil, brewers yeast, calcium sulfate, citric acid, fish oil concentrate, glycerin, maltodextrin, mixed tocopherols, natural imitation chicken flavor, oat flour, oat meal, propionic acid, rice flour, rosemary extract, rye flour, safflower oil, silicon dioxide, sodium alginate, sorbic acid, soy lecithin, starch, vegetable oil, water.